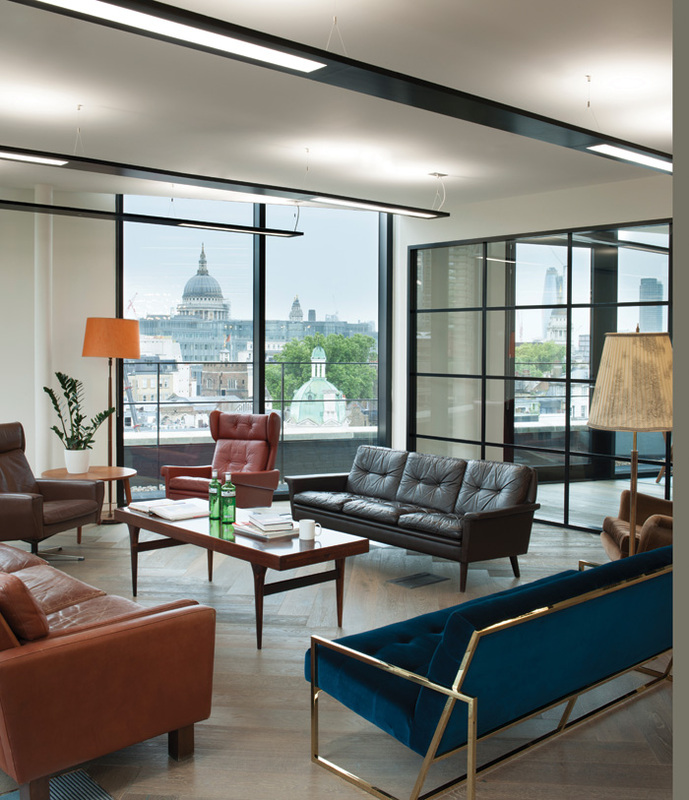 Having recently co-delivered a successful fit out for UK Green Building Council, architecture practice Barr Gazetas and design and fit-out company Morgan Lovell joined forces again to deliver new London offices for ad agency Anomaly. Completed in August, the scheme draws inspiration from the company’s ethos to challenge the norm, as Anomaly’s name suggests. Morgan Lovell worked closely with the Anomaly leadership team to imagine and deliver a workspace that celebrates the informal, the irregular and the seemingly unreasonable, including dedicating 75 per cent of the office space to informal working. In keeping with each of the other six international Anomaly offices, its London space is completely open plan, purposefully designed to support Anomaly’s ethos of open, entrepreneurial and collaborative working. Visitors who arrive to the sixth-floor arrivals lounge of the building can order a drink from the bar and take in the spectacular views of historic Charterhouse Square. At the heart of the office is a broad timber staircase leading down to the fifth floor. 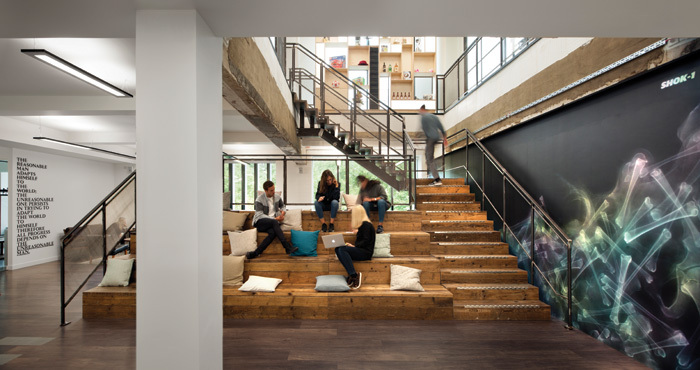 The staircase is central to the loose clustering of communal and solitary spaces that provide a choice of work areas. At the base of the stairs on the fifth floor is an auditorium space featuring bleacher seating clad in scaffold planks. Quiet reading booths are cut into the rear of the bleachers. 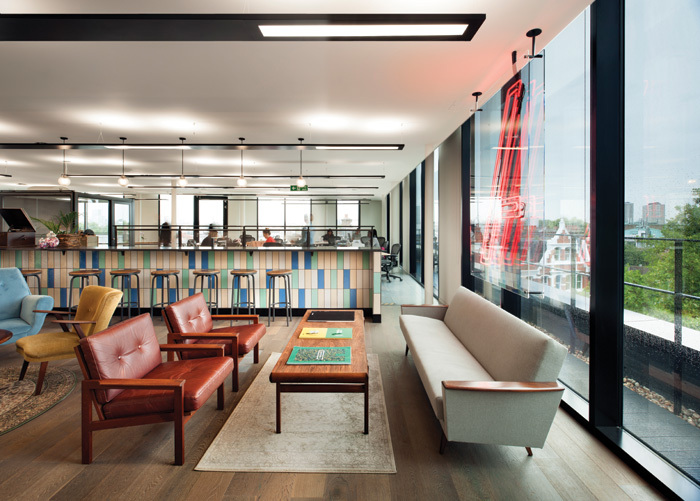 The interiors of the global ad agency’s London office reflect London’s history, the City’s creativity and local context. Lining the stairwell is a unique graphic wall by artist SHOKI; a mural relating to the plague victims’ burial ground in Charterhouse Square that features translucent bones on a black background. The colour palette for the interior scheme references the traditional Fox and Anchor pub located nearby, while further references are made to the building’s previous life as a hat factory. The furniture is an eclectic mix of new, repurposed and vintage pieces featuring alongside neon signs, custom-made coffee bars and distressed furniture. Much of the building’s raised floors have been left exposed as metal surfaces to work alongside other finishes, including metal-framed windows, timber-floor finishes, raw-ply linings, scaffold-board cladding and raw lacquered steel. The project was commissioned in March 2017 and completed within five months. The team was able to deliver within the limited timescale because of the track record of successful collaborations between Barr Gazetas and Morgan Lovell.